1. First of four: The first quarter of 2017 is set to end Friday. It’s been a wild and profitable ride for investors. The Dow Jones industrial average, S&P 500 and Nasdaq all hit their highest levels ever in the past few weeks. For the quarter, the Dow is up 4.9%, the S&P 500 has surged 5.8% and the Nasdaq has rallied by a stunning 9.9%. But it could end with a whimper. 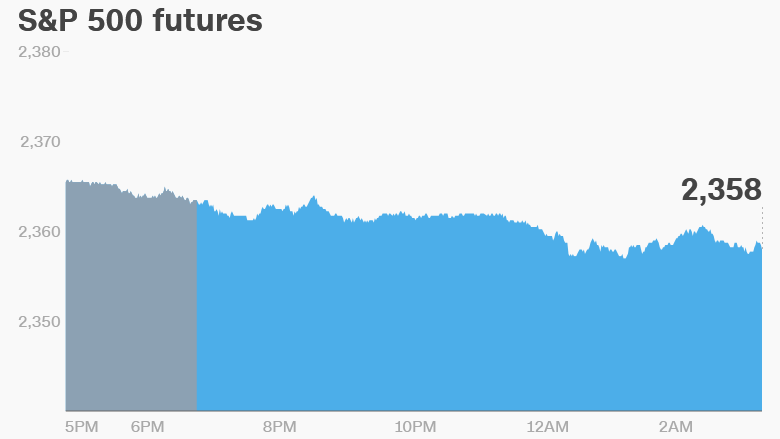 U.S. stock futures are looking rather weak. European markets are all negative in early trading, though the moves down are rather small. Asian markets ended the day with mixed results. 2. Rand rout: South Africa has fired its finance minister, sending the country’s currency crashing. The rand nosedived nearly 4% against the dollar after President Jacob Zuma ousted Pravin Gordhan, plunging the country into a new round of political turmoil and economic uncertainty. Gordhan had built a reputation as a steady hand who expertly guided South Africa’s economy. Some of South Africa’s biggest companies slammed the move, warning that it would have severe consequences for the economy, and could lead to the country’s credit rating being downgraded. South African financial services firms listed in London plunged. Investec fell nearly 9%, while Old Mutual fell 6%. 3. Trade talk: President Donald Trump will make the next move in his bid to reshape U.S. trade policy on Friday, signing two executive orders aimed at combating foreign trade abuses. These new executive orders come a week before Trump is set to meet with Chinese President Xi Jinping. China is America’s biggest trading partner — the relationship is worth about $ 663 billion annually. But the U.S. has a trade deficit with China because it buys a lot more of its goods and services than the other way round. 4. Earnings and economics:Blackberry(BBRY, Tech30) is releasing earnings before the open Friday. The Bureau of Economic Analysis plans to release its Personal Income report for February at 8:30 a.m. ET. The University of Michigan is releasing its March consumer sentiment report at 10 a.m.